This post contains affiliate links, which means that if you purchase something I recommend that I would get a small commission. I only recommend products I have used and love. I have always enjoyed working out. I was very active with sports in high school and after that I enjoyed taking classes in college like yoga, step aerobics, water aerobics, kick-boxing, spinning and other HIIT group classes. I’ve really tried about every type of exercise: cross-fit, swimming, running, Beachbody programs, Tae Bo, Biggest Looser, kettle bell, etc. I have seriously tried about everything out there with the exception of Zumba… I’m not sure why, but I haven’t dappled in that one yet. Looking back on my experiences with these different workouts I really did enjoy them all while they lasted. But today I wanted to share with you the 4 workout programs that I have done that are my absolute favorite. I would add P90X3 from Beachbody to my list, but I wanted to keep these workout programs to the free or cheap ones that can easily be done at home. I’m pretty sure this one is my all-time favorite. First of all it’s FREE. She offers 15 days of workout videos that are totally free plus a food guide to follow with the recipes that you need. The reason I love her program so much is because her workouts are about 20 minutes and I am always sore the next day (which means it works) and the second reason is because her recipes are DELICIOUS! I am a big time sugar lover and I want good food. Quinoa just doesn’t cut it for me. Her recipes are easy to follow and the food is full of flavor and she always includes a treat! The nice thing with the 15 day challenge is that it’s easy to loose at least 5 lbs. and you can just keep repeating it to stay on track and lose more. She does offer a 6-week paid program, which I personally have not done yet, but my cousin has and loved it. 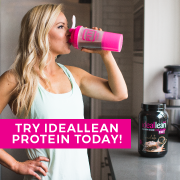 Another thing I love about her program is the IdealLean protein powder she created. I have been buying this consistently for about a year now because this stuff is amazing. It tastes great and it has only 80 calories and 0 carbs and sugars. She includes recipes to make delicious treats using the protein powder; things like peanut butter fudge, chocolate coconut fudge, maple nut fudge, raspberry cheesecake shake, chocolate lava cake, protein melting cake, and no bake cookie protein bars. I have not stayed on the diet consistently, but since one year ago when I discovered Trainer Lindsey I have continued to do her workouts and use the protein powder. I am about as frugal as they come regarding food, but this is something I feel is absolutely worth the money. I just watch for good sales, which they have going on quite often. Here is the site. If you want her free challenge, you just click on “challenges” and then you will see it under Trainer Lindsey. It’s the 15-day Fit Body Challenge. I’ve also tried Trainer Kaytlin’s 15-day knockout fitness challenge and I did like hers as well. I bought this program shortly after having my third child. I needed something to help get me back into a routine of working out and help me stay motivated. This was a great program for me and it did just that. I enjoyed the set up of the workouts and I love her theory that workouts don’t need to be long and extensive. I also love that the downloads came instantly and I could just print the workouts and do them without having to turn on the computer or TV. It worked best for me to print them out and create a workout binder. 5 years after purchasing this program, I still have her workouts and meal tips in page protectors in my workout binder that I still use. I love that I can complete one of her workouts in 15 minutes and still feel like I got a great workout in. I also like her flexibility on how many days you workout. You can either do two workouts (30 minutes total) three days a week or you can do one workout (15 minutes) 5-6 days a week. It is a 28 week program, so I feel like you get a lot for the money (about $40). I like how she teaches you about what and how to eat, but it is not a set meal plan every day. She has a list of choices you can choose from for each of your meals. This was a perfect program for me to feel motivated and get back in shape without having to spend tons of time dedicated to working out. I really could squeeze in a quick workout during nap time and still had time to do the other chores I needed done. I do still use these workouts. My sisters used Jillian Michaels’ Ripped in 30 DVD and they really liked it, so when I found the DVD at the Dollar Tree for only $1 as a January special I bought it along with her Extreme Shed & Shred DVD. Both workouts are about 30 minutes (I think the Shed & Shred is closer to 45 minutes including warm up and cool down). If you’ve ever watched The Biggest Looser, you know that Jillian is tough. She pushes you the same way in her workouts. Her DVD’s come with a 30 day meal plan. It includes set meals for breakfast, lunch, snack and dinner. Many of the meals are easy to follow, but others are a bit out of my comfort zone like Mahi Mahi Tacos. I have not been ready to take on those yet, but this helps give me guidance. Her workouts are hard, but very doable. In her Ripped in 30 workout she has a 3-2-1 system that I really like. It’s 3 minutes of strength, 2 minutes cardio, and 1 minute of abs. This system helps me stay focused and push through the hard parts. The best thing about her workout DVDs is that they are so affordable. If you can’t find them for $1 at the Dollar Tree then you can get about all of them on Amazon for less than $10 each. The last workout that I like to use is from Melissa Bender. She makes free at home workouts on YouTube that usually just require body weight. She has several challenges and programs you can follow on her website, benderfitness.com or you can search Melissa Bender on YouTube and choose a workout. I love how real Melissa is. She does the full workout with you on her videos so she gets tired and has to stop sometimes too, just like I do! She had a baby recently, so she created a 6-week postpartum workout challenge and she does her workouts during nap time or with her baby nearby. Her workouts are usually interval training mixed with strength training. They give me a good workout in a short amount of time. Most workouts are around 20 minutes. If you are a busy mom looking for a great fitness program to do at home or in the gym I’m confident that at least one of these programs will help you with your goals. Working out consistently helps me to feel nice and happy. Easter is right around the corner and I was thinking how much I look forward to Easter because of our traditions. My son said it just right; I reminded him that Easter is this weekend and he said, “when you say Easter a memory comes right to my brain and I know just what to imagine.” I think it’s fun for everyone when we can know what to expect on a holiday and have something to look forward to. Easter is a great time to get together with family. Cousins (usually) make everything more fun for the kids. My family usually gets together at my sisters house where the weather is typically the nicest this time of year and we can play outside. If you don’t have family nearby then you can invite a few family friends to join you in some of these traditions. It takes effort, but trying to be with family makes a great tradition in and of itself. Duh?? Right? Our family typically does a few of these. We have usually gone to big Easter egg hunts put on by the city, but last year we decided to avoid the crowds and just do a big one on Saturday with our family. When we do one at home, my parents always include a Golden egg with some money in it and this egg is hidden really well. My oldest nephew is usually the one to find it, but my kids are really hoping that this might be their year! It was honestly kind of nice last year to not fight the crowds at the big egg hunts. We have been to ones at a swimming pool where kids dive down and get eggs filled with coins. My kids were young and not great at diving under water, especially when they are completely surrounded by other kids doing the same thing and we left empty handed. It was stressful and sad for the kids (however, there are always nice kids who notice empty baskets and share). We’ve also been to big egg hunts where there were so many kids and not enough eggs and again left empty handed because my kids were less aggressive at getting those eggs! And of course, you always have to worry that there might be an Easter Bunny mascot on the loose at these events, which often showed up later in my children’s nightmares… I’m starting to think that maybe my kids need to toughen up?? Anyways, take a good look at your kids and their personalities and do whatever will suit them best. But realizing that we had more fun doing our own egg hunt was liberating last year… and there were no tears! My family also does an egg hunt Sunday morning when the Easter Bunny hides our eggs. I have a friend who asked their Easter Bunny to hide the eggs on Saturday, so that they can focus on spiritual things on Easter Sunday. There are many ways to include an Easter egg hunt in your Easter traditions. I’m sure this is an original idea… but if you want different ways to do this traditional event you can check out my pinterest board I created just for dying eggs. There are so many fun ideas out there! I know we are not alone in this tradition. Easter is the best time to find cute Spring dresses because so many people get an Easter dress. We also like to get our boys a new tie to wear to church on Easter. My amazing sister has made my boys a tie and my daughter her dress the last couple years and they turn out so cute! I’m hoping she will start an etsy shop soon so you can all enjoy her talent like I do! We don’t always have the budget for brand new church clothes, so homemade options are typically more affordable. I will include a few links below to great stuff that Amazon has to offer. Need I say more? Did you know that Amazon sells these in bulk!?? My friend filled me in on this best kept secret and now I’m sharing with you. You’re welcome. On Sunday morning, the kids get to come out of their rooms and see what was left in their Easter basket and then hunt for the eggs that the Easter Bunny hid. We usually fill their Easter basket with a movie or a book and then one big candy item. I refuse to buy those big pre-made Easter baskets that cost a fortune and are filled with junkie toys that will be broken or scattered across your floor untouched (see my No Toys for a year post here). I used to sell Usborne books, which we always gave to our kids on Easter. I still highly recommend these interactive books for Easter baskets. Since we go to church every week, I try to give them books that they will enjoy during church. We usually get our kids one thing as an Easter gift as well. This year we will give them muck/rain boots so that we are more prepared for mud season! Kites were a huge hit a couple years ago. My parents like to give all the grand kids a matching shirt. They have 6 grandsons and 1 granddaughter, so all the boys get a matching shirt and then my daughter gets to stand out a bit. We are looking forward to another Easter and the fun traditions we enjoy. I would love to hear what traditions your family has on this holiday. I hope you have a nice and happy Easter! I want to be more mindful about enjoying the moment. All the moments. Even the difficult ones, but especially cherishing the sweet ones. I have this quote framed and hanging right above my kitchen sink to remind me to do keep my kids and family my priority over all the stuff that needs done. Here is a free printable for the quote if you’d like. I’ve also included a printable of the poem. (You can also click on the images to get the PDF version). I hope I can remember to a be a nice and happy mom today just in case there is a last time. That’s right, I said it! My family has agreed to go a full year WITHOUT toys. We are not going to go totally crazy and get rid of all our existing toys, but for a full year we will not add ANY toys to our home. This means birthdays, Easter, Christmas, and school carnivals!! Why would we put our kids through such a year?? I will answer with a follow up question, “have you seen our basement!? ?” We really do have so many wonderful toys. And the kids do actually play with them now and then. But it honestly feels like we are picking up the toys from the floor more than they get played with. Looking back at the toys my kids got for Christmas, just 2 months ago, I can think of one toy that still gets played with. The rest of the toys are either broken, like the drone for my 2 year old (imagine that), or out of batteries. I have decided that more often that not, the fun with toys comes with the excitement of opening the toy and the first 5 minutes following. I was pleasantly surprised with how this conversation went down during dinner. The kids were enjoying this amazing homemade chicken Alfredo made from the instapot, which I will post about later; when my husband announced that we had something big we wanted to propose. We built it up by saying that the kids were going to want to complain at first, but that no one was allowed to say a word until after this idea had been explained fully and that we would take questions and comments at the end. When they all agreed not to whine or complain until they had fully heard us out, we dove right in. We explained that we would like for them to go a full year (now until Spring Break 2019) without adding any toys to our collection. They were a bit concerned about Christmas and how would Santa know not to bring toys, but we assured them that we could write to him and explain. My 9 year-old daughter said, “good, I was just going to ask Santa to surprise me this year anyway!” All of the kids were surprisingly on board with this idea. We gave them some ideas for things they can still ask for on birthdays and Christmas, like clothes and experiences. My son decided that if a friend comes over after giving him a toy for his birthday only to find it gone, that he could just say that he lost it. Rather than encouraging this white lie, I told him that along with birthday invitations we will include an explanation that our family is not adding toys this year. Friends can do other gift ideas, or better yet, just skip the gift altogether! By the end of the conversation and after these concerns were addressed, everyone was on board. In fact, my two oldest said that they thought this was a great idea and they think we should do this forever! We decided that if we can truly go a whole year without any new toys that for Spring Break next year we will plan a big family trip. I feel like this gives us all a reward and motivation to keep our focus. I do feel like the hardest part for them will be the little carnivals and dumb toys that they get at random events. Think of all the little 50 cent toys that find their way under the seats in your car and at the bottom of every toy box. And think of how excited those kids are to get those types of toys in the moment. School parties, Christmas parties, summer fairs and carnivals all seem to send home an unnecessary treasure of some sort. These little treasures will go straight to the trash or thrift store rather than into our home. The elementary school in our home town puts on an amazing fundraiser called, A Night at Hogwarts, every year and they go all out! My kids come home with a new wand, new creature (stuffed animal), and new pranks from the Joke Shop every year. I believe this may be their biggest trial. Bags (drawstring bags, duffel-bags, purses, etc.) these are easy and cheap to personalize too. Who doesn’t want a pair of prescription free glasses from Walmart?? After writing it down, we can see that the list of things we will NOT get is much shorter than the list of possibilities. Throughout the year, we are also going to work on getting rid of some of our current toys. declutter gift ideas minimize no toys2 Comments on A Year WITHOUT Toys! I know that some schools are starting Spring Break this week (ours is not one of them…). If we had not moved from Colorado this year, my husband and I would be on our way to Belize for the week enjoying beaches, jungles, under-sea walks, and of course the 20 teenagers we would have brought along with us on the educational tour that my husband organized as a high school teacher. He has taken students on educational tours to Spain and Peru, but I have never been able to go with him because I’ve always had a nursing baby. This was going to be my year to go to Belize! I’m not pregnant and no nursing baby! But we moved, dang it!! Instead we are in Wyoming with the snow and wind…. It really is OK though. I’m glad we are where we are and I’m grateful for the way things have worked out. I’m sure Belize would have been lousy (this is what I tell myself anyways). Our Spring Break is the first week in April and we will spend the first part hanging out at home and then head to southeastern Colorado for my Grandma’s 90th birthday party. We will stop in Denver and have some fun there, but no really big plans this year. So I thought I would come up with 10 free or cheap Spring Break ideas if you are also NOT going to Belize. Visit local museums. My two boys that are not yet in school went with me to a State Park visitors center that we have in our town and they really loved it! It really wasn’t anything overly amazing, but they had such a great time looking at the animal mounts and they haven’t stopped talking about it. After checking out the visitors center, we played on the playground outside and rode scooters along the trail. It was new to us, didn’t cost us a thing, and took up a whole morning. Discover a new hike or walking trail. Since we are new to this town, almost every trail is new for us. But I’m sure that you can find an area nearby that you have heard about and never been to personally. Ask around and make a list of new places to check out and then actually go check them out! Before we moved from Colorado, we had lived there 9 years and the summer before we moved we finally made it to see some local petroglyphs we had heard about, but had never actually been to. They were amazing and we ended up going there 3 times before we moved. We just wished we had done it sooner. So use this as the time to finally go and DO those things you have always wanted to see. Family yard clean-up. My kids love to help my husband and I with projects, but we are often in a hurry to do them, so we don’t always take the time to let the kids “help.” Use a week off from school to let them be your helpers. We bought our kids work gloves last summer and they love to put those gloves on and help us in the yard. Unless you are still covered in snow, it’s a great time to get outside and pull out the dead weeds, pick up dog poop from the neighbors dog who always finds YOUR yard to do his business, pick up the trash or leaves that have blown into your yard over the last few months, rake the grass, prep flower beds, transplant flowers or bushes, trim trees and bushes, and whatever else you notice needs done. I was outside playing t-ball with my son last week and it was my first time in our backyard in awhile and I found a TON of things that needed done, so this will definitely be on our Spring Break agenda! Family Service Day. As a family, think of ways to serve your neighbors, friends, or family and actually DO it! I know that we often have the thought to take cookies to so and so, but I honestly hate making cookies! It seems like every time I make cookies that I realize part way through that I am out of an ingredient, so I either have to stop what I’m doing and run to the store or look up a substitute for that ingredient or make a different type of cookie altogether! Then once I finally have the cookies finished it is so hard for me to deliver them before I eat them!! I’m not kidding! It took me three batches of cookies to finally get some delivered once. Anyways… use your time off to get those cookies made (make plenty of extras for your family) and then get out and deliver them right away!! Another service that my family enjoys is picking up pine cones for neighbors. We developed a great friendship with a lady in Colorado by picking up her pine cones regularly. She always invited us in for ice cream and she liked to pay the kids for their work. Swim in a new pool. This one might require a bit of traveling and possibly up to $20 (depending on price and the size of your family), but hopefully it would be worth it. Kids love to swim in new pools… have you ever been to a hotel pool with your kids? We just went on a long road trip for State Gymnastics and stayed in a hotel for one night. The kids got to swim and that one hour of swimming made the 17 hours in a car over 2 days totally worth it! There is nothing fancy about a hotel pool, but kids are always excited about it because it’s NEW! So do some research and find a cool rec center pool that is within traveling distance and make a day out of it. The kids will love it! Science experiment day. There are so many great science experiments on Pinterest that you will have no trouble at all filling up an afternoon. This is another one of those things that I always want to do with my kids, but just don’t always find the time to actually do! Have the kids help you make a list of supplies you need, run to the store and buy those supplies, then you could have the kids take turns being your helper for the different experiments. I created a board on Pinterest just for science experiments and you can follow that board here. I will also include links to great science kits below that you can use over and over! I used to teach a summer science class and I used these supplies every summer and the kids always loved them! If you really wanted to go all out, you could get these little lab coats that they will love! Art Day. My kids love art! I used to teach an art class (along with the science class) and my kids and I really enjoyed learning different types of art and we created some amazing work! There are so many resources for you to learn from if you yourself are not an artist. I would not consider myself an artist by any means, and yet I was able to teach kids how to create some incredible products! YouTube, Pinterest, and my amazing nephew were my guides. You can do several ideas at home, but it is also fun to take a little field trip to a scenic area and let the kids draw or paint what they see in nature. We did this during my class and if the gnats had not been so bad, it would have been really fun for the kids. My favorite YouTube channel is Fun2draw. My kids love watching these videos and they end up with impressive work. For a gazillion great art ideas, you can follow my Pinterest art board here. I will include links below to the art products that I used and loved in my art class. Movie Marathon. Find a series that your family loves. For my family, that series is Harry Potter. We are slightly obsessed. My 2 year old talks about Buckbeak, dementors, Voldemort and “expelliarmus” all the time to strangers and I think they are a bit concerned… I haven’t let my kids watch all of the movies yet, but they somehow have convinced me to let them watch the first 5. I have the remote in hand and skip a lot during numbers 3-5, but they still love them. You could also include books on tape in the marathon. This could be an all day sort of thing, or one movie per day as a movie night throughout the week. Your local library might have all the movies available. And if you aren’t sure what series to try out, please, please try Harry Potter! Family game day. There are so many great family games on Pinterest for family reunions. But why wait for a big reunion?? As a family, plan a few games and gather all the needed supplies. Invite another family or two over for appetizers and games. We enjoy family Olympics, the Amazing Race, Family Fued, relay races, wack-a-cracker, and minute to win it games. I have created a board on Pinterest for some other fun ideas here. Go for a Drive. Simple enough. It may sound boring to the kids at first, but our kids have come to love our drives. We don’t always have a plan of where we are going, but we usually have fun along the way. My husband made up a game to teach the kids left and right. Every time he drove up to an intersection, the kids took turns directing him to turn left or right. If they said left, but really meant right then he still turned left. They quickly caught on which was left and which was right. It is a fun way to see new places. We also like to take drives out of town. We’ve always lived in rural places where we are out of town and in the “hills” very quickly. We like to take new turns and discover new places in the middle of nowhere. Here are a few links for the science and art things you might want to try. I hope you have a nice and happy Spring Break! It’s finally starting to feel like Spring! The weather has been so nice the last few days, which means that snow is finally melting! Our house is on a hill so a lot of the run off is going in the gutter right in front of our house. My kids have been outside creating different paths for the water to flow in the snow, creating pools and dams, adding bridges, and floating boats down the “river.” They have loved it! They’ve also been doing it barefoot, with shorts and no jacket! I finally had them put on snow boots thinking that might keep their feet dry, but that didn’t work either. Now their snow boots, socks and feet are completely soaked and freezing. Begin by gathering all the current winter clothes and have kids try everything on and decide what will fit next year and what will not. Anything that no longer fits either gets passed down to a younger sibling or if it is your last child that has outgrown the item then GET RID OF IT! Either donate it, sell it, or pass it along to another family (my personal favorite option). Make an inventory of the items that each child still has for next year and what items need replaced. Click here: winter clothes checklist for a free checklist you can print off and use for this task! This is a perfect time to buy needed winter clothes for next year. I did this last Spring, and it was seriously AMAZING to pull out the winter clothes tub and have everything the kids needed ready to go! And I got some major deals on quality coats and snow pants when I bought them in the Spring. I found my best deals on Walmart.com. Now that you have everything needed for each person next year, it is time to store these clothes. I use 3 Rubbermaid Storage Tote s: one for parent clothes, one for kid clothes (since I have 4 kids, I had to buy an extra large tote or you might need more than one regular sized tote), and one for extra clothes. I only put the needed items that fit each person in the parent and kid totes. If there were extra clothes that someone had outgrown, but wouldn’t fit the younger ones quite yet, then I put it into the “extra” tote. I also like to layer dryer sheets in with the clothes to keep them smelling fresh and if moths are a problem where you store the totes, then moth balls might be a good idea as well. Label each tote and store! Next year on that first snow (which happened for us in SEPTEMBER! ), all you need to do is grab the “kid winter clothes” tote and distribute the pile of clothes that belongs to each kid and they are ready to head out to the snow! It was so simple this year that I am wondering why I used to just throw everyone’s stuff all in the tub and then have to scramble to see what fits and then get to a store and buy things at full price! That is crazy! I’m sure the list goes on and on. My family is at a wonderful stage right now where we can sit down as a family and eat dinner 7 days a week (my daughter does have to miss 1 day a week occasionally, because of gymnastics.) I know my family might not be able to maintain 7 days forever, so for now I am soaking it in and enjoying every minute. Have a child help you make dinner and set the table. This is great because that child feels ownership in the meal and is “on your team” when it comes to making dinnertime meaningful. During dinner, be sure to compliment him or her on how much you appreciated the help. The rest of the family usually joins in on giving compliments (thus the “higher self-esteem” benefit from above). Compliment the cook. My husband is the one to set this example at our house. Ever since we were first married he has always thanked me for dinner (even when we go out to eat he does this if it was my idea to eat out). At first I didn’t realize how important this one was, but as my kids get older I have begun to recognize the value. He is setting a good example for them to have gratitude and good manners. After he thanks me for a meal, the other kids follow. More than once, my son has written in his gratitude journal (be sure to read my post on gratitude journals here!) that he was grateful for dinner following his favorite meal. If one of the kids helped to make dinner then my husband thanks me as well as that child. No electronics at the table. We are lucky that our TV is in the basement and nowhere near the dinner table, so we are not even tempted to watch TV during dinner. However, with phones and tablets we can now watch shows or text people or browse social media anywhere! We have made it a rule that there can be no electronics at the table. That means that if the phone rings or dings to notify a text, my husband and I ignore it. There have been a few exceptions when we need to take a call, so we always ask permission first from the rest of the family. There have also been a few times that we are having a discussion on something that we disagree about or want to know more about, so we might ask permission to use the phone to look up information quickly. But overall, this is a strict rule that I know will become more important as my children grow up and get their own phones. That is why we are setting the standard now. Eat dinner before starvation sets in. There are a few days of the week that we are out at an activity and come home right at dinner time. I have noticed that if we come home hungry and I still have to prepare dinner that everyone gets hangry and is less social when we finally do eat dinner. When I am at the top of my game, I have dinner in the crock pot or in the oven with a timer ready to eat when we walk in the door. That way, we can walk in the house and smell the amazing aroma then sit down and eat immediately. Attitudes are good and bellies get full before the hangryness begins! Talk about your day. There are many ways of doing this. But the important thing is that you establish how you want to do this and you do it. When we take turns talking about our day, it significantly reduces the wild and crazy boy stuff I described earlier. My family does “sweet and sour, service.” Each person takes a turn describing the sweet part of his day, the sour part, and one way how he served someone else. It has been a great way to teach the kids to be reflective on their day and has helped them understand service. My little ones still ask me if I know of a way they served, but my older kids are starting to identify the service they provide. I love that everyone gets a turn to share and it helps teach the kids to be good listeners. I hope that these 5 things can help make your family dinners more meaningful and I would love to hear other ideas that you are doing in your family. Good food and good company always help me to feel nice and happy! I seriously love this cardigan. It goes with about anything, it’s lightweight and comfortable. My mom gave me a compliment when I first wore it, so I bought her one for her birthday! She is not easy to buy clothes for, but she actually wore it and said that she received several compliments. I love that it is less than $20 too! I actually bought 4 swimsuits from Amazon so that I could try them on and send the ones back that didn’t fit right. I ended up keeping these two. I was worried that the one piece would feel like a “granny suit” just because I am not used to one pieces, but I surprisingly love it! The mesh gives it a bit of flare and the tummy control waist is my favorite! I’ve worn it to a pool twice now, and it is comfortable and stays put while I am going down slides and bending over to pick up kids out of the kiddie pool. The tankini has a really cute back and a sporty look that I love. It was a little baggy in the chest area on me, but some of you may not have that problem… My only other complaint was that it floated up a couple times in the water. I just sort of tucked it in and then it was better. I really wanted some boots to wear with skinny jeans in the winter. I bought three with the intention to send a pair back, but in the end I decided to keep all three pairs. My favorite of the three are the ankle booties. They are so comfortable and go with everything! The other two are also comfortable and nice to have on snowy days. It was fun to shop while sitting on my couch by the fire and it was easy to return the items that didn’t fit right. Out of 8 items that I bought, I kept 6. That felt like pretty good results to me! A little shopping spree now and then always help me feel nice and happy! This is going to sound like an interesting meal, but I can promise you that these cheese enchiladas are delicious! This was one of my favorite meals that my mom made and now it is one of my kids’ favorites. Just like most of the recipes that I post, this meal is quick, easy and kid friendly! Add the tomato sauce, chili seasoning, beans, and some water (about half a can from each tomato sauce can). 5. Sprinkle cheese into a tortilla and roll tight. Place in the pan on top of the chili. 8. Cover with foil and bake at 350 degrees until heated through and cheese is melted (30-40 minutes). 9. Garnish with shredded lettuce, cheese, sour cream, ranch, or whatever your heart desires! I hope you will give this a try if you are struggling with what to make for dinner. I’d love to hear how it turned out. This meal is sure to make my whole family nice and happy! I’ve mentioned my crafty sister before and I’m sure I will again and again. She is seriously so creative and talented. She recently bought a new house and now is gutting and remodeling it. I can’t wait to see how it turns out! I have asked her to take several pictures so I can add decorating ideas on this blog. She recently refinished a dresser using Annie Sloan chalk paint and was kind enough to write a quick tutorial on how she did it. Today, I want to share a tutorial on how to paint a dresser with minimal prep for maximum results. I started with this dresser, this thing is HEAVY!! It came with two matching mirrors, which I chose not to keep. The idea I had was to use this as my TV entertainment center. I started by cleaning it well with TSP cleaner . This stuff is great for cleaning grime off stuff. It is a powder mixed with hot water. I just wiped it down really well. Then I took an Orbit Sander and went over the top and sides well. The top had some damage so I sanded those areas really well. Because I was using the Annie Sloan paint, no prep is required, but wanted a smooth surface to begin with. After sanding I wiped the dust off really really well. Then I just went for it. I did not use an Annie Sloan paint brush, just a regular bristle brush . I was surprised how easy it went on and how well it covered, but I decided to do another coat on the top. It was a little tricky, because this paint drys fast, so I needed to work quickly to make a nice and smooth finish. I loved how the details popped out after painting it!! I let it dry overnight. It was a little rough to the touch. Not rough like sand paper, but just not a slick smooth finish. Which I know is part of the chalk paint. It has no sheen so it is not as slick. After spending all of this time on the dresser, I did not want it to chip or scratch. I used some clear Annie Sloan wax to put a good protective coat on top. Immediately after applying this, I did not really like how it felt. It still was not smooth and felt it would scratch too easily. I decided to be patient and allow the wax to really cure….to my pleasant surprise as it cured, it began to really smooth out. It is not as smooth as a newly varnished table top, but felt good. I did not hate the hardware and mostly did not want to buy new hardware, so I decided to spray paint the original hardware white. I took off the fabric that was behind the doors and painted the wire mesh white. There were drawers inside the door area, but I took those out and will re-purpose with another project. I now have shelves that will hold my DVD player, etc. I love how it turned out! This was my first experience of using Annie Sloan paint and I was very happy with it!! I still have at least a half a pint left so I will be using it for another project. I love how this turned out for my sister and I can’t wait to see it set up and being used! I have a dresser in my living room that has been passed around in my family for several years and seeing my sister’s dresser makeover has given me the motivation to redo this dresser. So hopefully, more dresser makeovers are to come! Beautiful and simple DIY makeovers make me nice and happy!